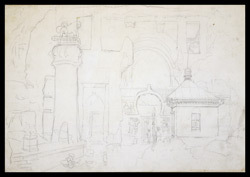 Pencil drawing by Henry Salt (1780-1827), of the exterior of the rock temple at Karli in Maharashtra, dated 25th October 1804. This is probably a first sketch for 'Ancient Excavations at Carli', plate 14, of Henry Salt's 'Twenty Four Views in St. Helena, the Cape, India, Ceylon, the Red Sea, Abyssinia and Egypt'. This view shows the great Buddhist Chaitya (hall of worship) at Karli (Karle). Dating from some time between the second century BC and the first century AD, the Karli caves are in the Poona district of Maharashtra, and this chaitya is the largest rock-cut cave in India. Viscount Valentia (George Annesley) described the carvings and entrance screens as greatly damaged by human hand, but was much impressed by the grandeur of the huge arched roof. The cave is also distinguished by the entrance pillar, which is 24 feet high and eight feet in diameter, with a summit carving of four lions.